Is There Life Beyond Jewelry? 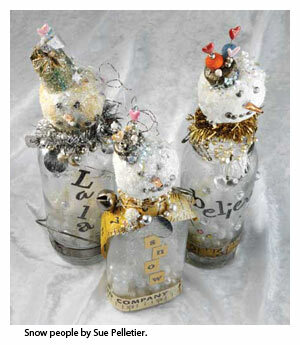 There is life after jewelry: mixed-media art! Please welcome today's special guest, the features editor from Cloth Paper Scissors, Cate Prato. She is bringing you a festive way to use beads and more in a seasonal project that will add sparkle and warmth to your winter days. It's a delightful way to use your stray treasures in every medium, and especially to find a home for those precious orphan beads. Enjoy! –L.R. Mixed-media artists love shiny beads, interesting metal, and funky found objects as much as you do–they just use them in different ways. A great example is the bejeweled snow people on the cover of Cloth Paper Scissors' November/December 2008 issue. Those frosty characters launched a flurry of creative activity. No sooner had the magazine debuted than we began receiving e-mails and links to blog posts showing beaded and baubled mixed-media snow people that readers had created. Santa snowmen, Victorian snow ladies, Hanukkah snow people made with blue bottles–we even received a picture of a bridal snow couple! One reason we think they are so popular is that they are easy and fun to make. Another reason is that they use up all sorts of sparkly odds and ends, such as pearly beads and garland, vintage jewelry pieces, wire, charms, and shiny found objects. So, go wild and experience life beyond jewelry with Cloth Paper Scissors. Gather up your lonely charms, broken but beautiful findings, pearly and sparkly beads, bits of wire, tinsel, and found objects, and start making snow people. Experiment by adding fabric "scarves," paper cutouts, and spritzes of glitter. They make great centerpieces, mantel décor, and gifts. Note: The materials listed here are for making the snow people that appeared in Cloth Paper Scissors. Adapt the decorations to use what you have on hand or to suit your own style. 1. Fill the bottle with inexpensive pearls and white glass beads to add an unexpected touch of whimsy as well as depth and weight to your piece. Set the filled bottle aside; this will be the body of the snowman. 2. Roll out a ball of white clay for the head. Try not to make it perfect; the imperfections will lend charm and character to the snowman. Create the face with the brads and nails, attaching the features by applying a little gel medium and then pushing the hardware into the clay. For the nose I used a small piece of copper foil. 3. Add a hat. It was fun coming up with playful combinations for hats. For the jaunty hats I used metal pastry tips, perfect for a conical top hat. Charms, bells, metal jacks, and other vintage bits added pizzazz. I also made hats from costume jewelry pins that I stuck into the clay at an angle. Tip: To add a little magic, brush the hat and the top of the head with a little glue and sprinkle with diamond dust glitter and chunkier glitter flakes. 4. Embellish the body. Apply glittery letter stickers to the bottle to spell out holiday wishes. Add sparkle with jewels and rhinestones. On some snowmen I glued pieces of measuring tape and ribbons around the base of the bottle. 5. Carefully attach the head piece to the bottle by gently pressing the 2 sections (clay and glass) together. A bit of glue and more glitter will complete this step. 6. Now create a scarf. 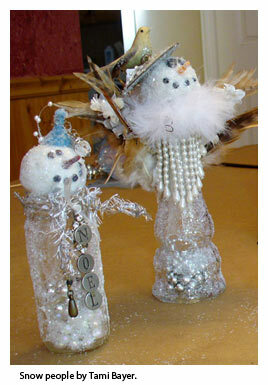 Cut a length of garland and attach it to the "neck" of the bottle with gel medium. If you use felt, you can pin it together around the neck. Embellish the scarf with charms, keys, and beads hung from wire. 7. Spray the snowman with glitter for a final flourish. Remember to let your beads and found objects speak to you, and your snowman will develop a personality all its own. For more fabulous mixed-media ideas, subscribe to Cloth Paper Scissors and discover a whole new way to use your creativity! Are you a beader looking to mix up your stash with other media? Or, are you a mixed-media artist bringing beads into your work? Please share your journey with us here in our comment box!